We support Iran Visa Authorization Code only for our clients who have registered for Damavand Private Tour. Before starting the visa process, dependent upon their nationality, applicants should pay deposit and register their tour at least 30-60 days before the trek. See also Deposit Policy. Please remember we are not an Iranian visa agency and we are not interested to support any other visa application.Read more details in Iran Visa. The cost to get an ordinary visa reference code is 50 Euros per person and it is different from the visa fee which you must pay to the consulate/embassy when they stamp the actual visa on your passport. 20- Have you ever been in Iran ? • We need a general itinerary (it may change, but we need the idea of your program). • JPG format. Not exceeding 50 KB. 28- One recent photo of applicant. • It should be in white background and not exceeding 50 KB. • It Can be taken by a digital camera or scan of previous photo, (just note it should be recent photo). Iranian Consulate for collecting the visa or Visa Issue Place: In this field, write the name of nearest Iranian embassy/consulate to your leaving place, the most convenient Iranian embassy or consulate in your area which you can collect your visa easily. Or you may write the IKA Airport in Tehran, Iran. In case of any refused visa, the full refund will be payed to that client except 50 Euros for his/her visa fee because in the visa process and to obtain the Visa Reference Code, the visa charge is paid to the travel agency to apply to Iran Ministry of Foreign Affairs, so the visa fee is not refundable in case of any cancellation or if any visa request is turned down. After receiving your visa form and the scan of your passport we will apply to Iran MFA-visa section for the Iran Visa Reference Code. Depending on your nationality the visa process may take 2 days upto 4 weeks (or even more) and when they give us the number and the confirmation letter we will send it to you by email. By that confirmation letter and in 30 days time you can go to your nearest Iran’s embassy or IKA Airport (as mentioned in Visa Issue Place field in your visa form). After that, in a few days process your passport will be stamped with the Iran’s visa. The Iran visa reference code is valid for 3 months from the date of issue. 1- Visa authorization reference code by MFA. 2- Passport with 6 months validity. 3- A completed visa application form. 4- Two passport size photos. 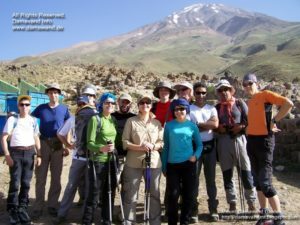 Visa for Damavand trekking tour. Iran Visa Authorization Code. Price for Iran visa reference number. Iran visa at on arrival airport. Iran Visa Policy. Iran visa for sightseeing tour. Visa for Damavand Private Tour. Iranian visa agency. Iran visa application form. Cost and price to get an ordinary Iran visa reference code. Iran visa fee. Actual Iran visa on your passport. Refused visa and refund policy. Iran visa charge. Iran visa process and time. Iran visa authorization reference number.